Stoker is unusually symbolic and vivid with its imagery. We would be lying is we didn't say we were impressed with its distinctive style and flair. And yet, all of its definig qualities goes to waste with a meaningless story. One that will leave you frustrated and wished you didn't waste your time with a film with no rhyme or reason. India (Mia Wasikowska) has just lost her father. Mysteriously, her father's gift was different this year. Before, her gift was always a pair of shoes ofnthe same design but this year, what she got was a key. As she and her mother, Evelyn (Nicole Kidman), tries to cope with her father's death, her enigmatic Uncle Charlie (Matthew Goode) moves in. Although suspicions about his motives are raised, India and Evelyn soon find themselves drawn to him. Almost everything in Stoker works except for one very crucial and important thing which is the plot. The acting was superb and the cinematography outstanding. Stoker has its own style and flair that ramps up the interest, suspense and even fear. 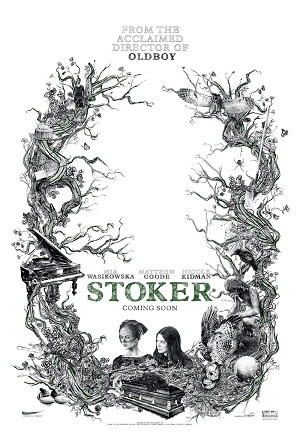 Unfortunately for Stoker, it feels like it baited you into wanting to know the real story. But once the twist has been revealed, you feel cheated and tricked. The story is a pure nonsense to be frank and one without any moral or reason to exist and thus, Stoker shouldn't exist as well. All the good things are not worth it because in the end, Stoker feels such a waste of time. Want a purely cosmetic film than Stoker should be your bet. Everyone else should avoid it at all costs.